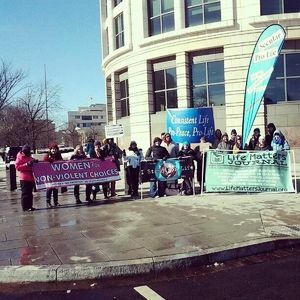 Consistent Life members joined the March for Life in Washington on Wednesday, and shared their broad message of protection of life with other participants. Some thirty seminarians bunked down at the Oblate offices in Washington for a couple of days, while attending the March. A group of seminarians stays each year in the JPIC office space and other common areas of the OMI headquarters. We trust they stayed warm! Official Washington was shut down on Tuesday due to snow, and many area schools were still closed on Wednesday. The March for Life, however, proceeded as planned. CL Endorser Shane Claiborne commented on the Roe anniversary in the Red Letter Christians blog. BuzzFeed Politics did a photo essay on the Consistent Life contingent at the March for Life (CL and member groups Feminists Choosing Life of New York, Secular Prolife, and the Prolife Alliance of Gays and Lesbians, as well as friends at Life Matters Journal). Consistent Life exhibited at the Cardinal O’Connor Conference, the Students for Life of America National Conference and the March for Life Exhibit Hall, reportedly receiving a lot of favorable responses at all of these.